Matchroom chief Eddie Hearn admits talks are well under way about a clash between Carl Frampton and Scott Quigg – and insists he does not care where the bout takes place. A mega fight between IBF World Champion Frampton and WBA World champ Quigg looks set to take place in the summer – if talks go well. Belfast, Manchester and London have been mentioned in dispatches and Hearns insists he would put Quigg in with Frampton in any city. “I don’t care where the fight takes place. You can have it in Belfast, Manchester or London. “The best place to have it, is where is makes the most money. People tweet me and say ‘It’s just about the money for you’ but I am representing my fighter and the fighter gets the money. “I don’t get the money. I work for the fighter and of course if the fighter does well then I do. “But my job as a manager is to maximise the earnings of Scott Quigg. “And that is why Cyclone do it. Don’t be fooled about ‘it’s for the good of boxing’. Of course that is important but we have to make this fight for the fans. “But we also have to make sure when a fight of this magnitude arrives – maybe once in their lifetime, or their career. “They are both so lucky because they have two World champions in the same weight division. And both are from Britain. It is a great opportunity for both of them – so we have to make it happen for them. “Let them have a chance to set themselves and their families up for life. “But to do that you have to maximise all revenues – so let us look at the venue. “Can we do 30 or 40 thousand outdoors in Belfast? If we can only do 20 or 25 thousand we have to go indoors, because the cost of staging an event outdoors does not make sense. “We could do the MEN in Manchester, but Carl would bring seven thousand to the show, or do it in London. “I don’t mind where is takes place. I know that Scott Quigg and Carl Frampton do-not care where the fight takes place but we all have to make the right business decision in terms of where the fight takes place. And Hearn says working out what television channel the fight will be on – Sky or ITV – will be easy to sort out. “That’s simple. What are the offers? The money is more important than the profile. “Sky are one of the biggest broadcasters in the world. They are not some small channel. “It is great to have ITV to be back in boxing but let us see what their offer is. “I know the rights’ fee from Sky for this fight is going to be huge – so we will see what ITV comes up with. “But as always I will present my client with the best opportunities and if they want to box on ITV for the numbers they come up with. “That is no problem for me ,but I can guarantee you that there is not one fighter out there that doesn’t want to get paid the most money possible for every fight they are in. 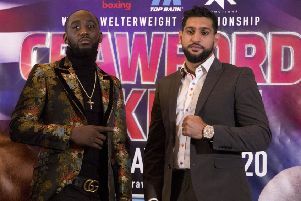 “And if you get an opportunity like this – with two great fighters with two World titles on the line – I am going to maximise it for as much money as I can for my client. “And if I wasn’t doing that I would not be a good promoter. I think this is a pay per view fight on Sky. If I get this fight on Sky it will be box office.